In the early 2000s, a company named Ideco, in close partnership with IDEMIA, was a driver in bringing biometric technology to the South African market. In fact, this company was so successful that South Africa became a world leader in biometric adoption for a number of years. The first employee, and eventually managing director of Ideco Biometric Security Solutions, was Gary Jones; he developed a successful channel model which proved so successful that Morpho quickly became the leading fingerprint biometric technology in South Africa. Jones then moved to the USA in 2009 to join Morpho and lead the restructuring of the channel in that region, which includes most of the world’s largest and leading manufacturers of access control and time and attendance systems. With the coming together of Oberthur and Morpho, the company is now known as IDEMIA. Jones is now IDEMIA’s VP of Global Channel and Marketing for biometric access and time solutions, and is tasked with broadening the company’s market share and share of mind globally. This is happening at a good time as IDEMIA is now focused on Augmented Identity. Far from just being another marketing slogan, Augmented Identity has a basis in reality, specifically when it comes to security in our daily business and personal lives. Jones says there has always been a trade-off between security and convenience in the real world. If you wanted security, you had to accept complexity; if you wanted convenience, it was security that was compromised. Augmented Identity, as Jones explains it, is a reliable identity authentication mechanism that fits in with whatever we are doing, providing the convenience, while also ensuring trust to guarantee secure, authenticated and verifiable transactions. The MorphoWave Tower was the first product aimed at this market in the biometric access and time space. It allows people to authenticate their identities simply by scanning (or waving) their fingerprints over a scanner while on the move – without having to touch a sensor. 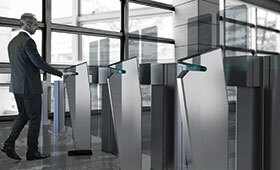 The Tower has done extremely well in the US market due to its convenience as well as the security it offers (its sensor technology is also certified by the FBI). As you wave your fingers over the scanner on the MorphoWave, it scans all four fingers at 78 fps (frames per second) and it does a 3D scan. This is like putting your fingers on a traditional sensor 78 times in a second. This naturally collects high resolution data which increases the matching rate and hence the security of the fingerprint biometrics. Additionally, because people don’t actually touch anything, the hygiene factor is increased and more people can be scanned faster. Jones says it’s possible to authenticate 45 people per minute as they walk down a passage or through an entrance, with a single device. To cater for a wider diversity of installations, as well as more cost-conscious markets like South Africa, IDEMIA recently launched the MorphoWave Compact, which offers the same authentication facility at a lower cost. He says IDEMIA’s partners in the region were very excited about the Compact and were selling it before it even landed in Africa. Of course, the company has a number of other products, including facial recognition solutions to supplement the MorphoWave in its pursuit of its Augmented Identity ideal. With trips to South Africa a regular part of his job these days, Jones says South Africa and Africa are key markets for IDEMIA, partially due to the country’s history of biometric adoption, as well as the willingness of the market to push the boundaries. The market in South Africa today is different from the one in which the former company Morpho and Ideco were able to establish fingerprint biometrics as a reliable and trustworthy identity authentication mechanism all those years ago. There are more companies active in the market and more competition, but Jones believes IDEMIA is in a good position to take the market to the next level as both businesses and individuals embrace the ease and convenience, as well as the improved security in a world of Augmented Identity.